The new, state of the art, Hexham Bus Station has opened its ‘stands’. The £2.28million investment in public services and regeneration for the town saw an official opening ceremony, with buses rolling from its five stands from today. Symbolising the move from the old to the new, a 1949 Bristol single-decker, ex United Automobile from the Aycliffe and District Bus Preservation Society drove guests from the old bus station to the new facilities, at Loosing Hill in the town. At the new station the vintage bus joined one of Go North East’s modern Tynedale Links vehicles, where the opening ceremony was conducted by Cllr Grant Davey, leader of Northumberland County Council, and Cllr Ian Swithenbank, cabinet member for local services. Funding for the new development has come from Northumberland County Council, and includes a grant of £300,000 from the North East Rural Growth Network’s Strategic Economic Infrastructure Fund. Council leader Cllr Grant Davey spoke at the event about the council’s investment in the market town of Hexham, which includes the bus station, a new fire station, a stunning new wedding and accommodation venue, a new ‘hub’ for frontline council services and recently announced plans for a new multi-storey car park. Cllr Davey said: “This is a further piece in the investment jigsaw for our market towns. Here in Hexham we are constructing a new fire station just across the road behind the hospital, and redeveloping the Grade II listed Hexham House - to make a beautiful wedding venue and provide holiday accommodation that will bring much more business to the town. “We are also investing in bringing a range of frontline council services together, with easy access, at the Queen's Hall, and have just announced plans to build a new multi-storey car park in the town to manage the growing number of workers, shoppers and visitors. The new bus station provides modern facilities for passengers including an enclosed waiting area, toilets, refreshments and travel information. There are also facilities for bus company staff. The attractive building was designed by ‘plus three architecture’ (+3A) to reflect the past, present and future of Hexham as a thriving market town. The design provides a connection to the character of the town and creates a distinctive new place within the urban fabric. The building features natural sandstone, glass windows with stained panelling, wooden seating and planting areas. 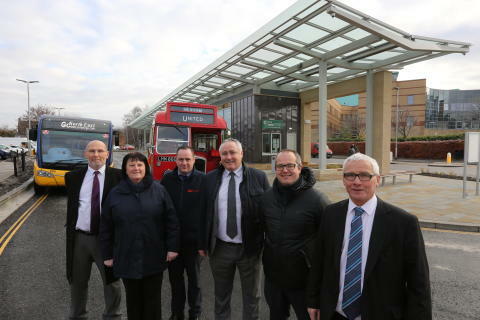 Cllr Ian Swithenbank, cabinet member for local services at the council said: “I have been extremely pleased to declare this new bus station for Hexham officially open. It is set to provide top class facilities for bus users, within a most attractive new building. In a ‘double-decker’ boost for Hexham, building the new bus station at Loosing Hill has released a prime development site on Priestpopple near the town centre. Dysart Developments Limited has gained planning permission for the site which will include new shops, housing and a pedestrian route to town centre parking and further retail at the Marks and Spencer and B&M Stores site. The scheme will provide 2,466m2 of commercial floorspace, 31 apartments and five affordable homes, and is expected to generate in the region of 126 jobs and other significant economic benefits to Hexham and the wider Northumberland economy. These economic benefits have attracted a significant boost to the bus station project through funding from the North East Rural Growth Network’s Strategic Economic Infrastructure Fund. The Rural Growth Network secured £6 million capital investment from the North East Local Enterprise Partnership (LEP) Growth Deal - Local Growth Fund to support businesses in the rural areas of Durham, Gateshead and Northumberland. Gillian Hall, North East LEP Board member, said: “Transport and connectivity are important themes in our strategic economic plan and key to improving access to employment and services across the North East. Refreshments for passengers and those visiting the new bus station area will be provided by a new business called Tasty Bites, which has also created two new jobs. Local businesswoman Deb Humble from Country Concierge has opened the catering outlet which will provide tea, coffee and home-made soup to take-away along with sandwiches, cakes and other sweet and savoury snacks. The new bus station and site are owned by Northumberland County Council and will be managed by Go North East. Bus services which run through the town will still stop on Priestpopple, allowing the same access to the town centre as now for shoppers and those who are going to and from work. Find out more about services in Hexham at gonortheast.co.uk.